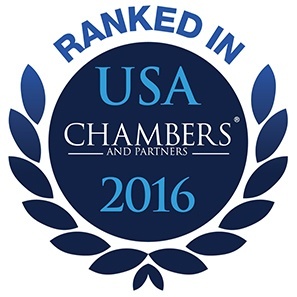 White and Williams has once again been recognized by Chambers USA as a leading law firm in Pennsylvania for achievements and client service in the area of insurance law. White and Williams was recognized for offering advice to insurers and reinsurers across a range of areas, including coverage, bad faith and excess liability. The firm was described as "a go-to firm for reinsurance disputes in Philadelphia." The firm was also recognized for its adroit handling of complex alternative dispute resolution cases, with clients saying "they have very formidable folk." Patti Santelle and Gale White were recognized for their insurance practices as well. Patti was characterized as a "formidable" litigator who provides high-quality advice on sophisticated insurance coverage matters and is well-versed in asbestos and long-tail claims. Gale was described as a "very smart, very well prepared and very effective attorney" with extensive experience in property and casualty coverage and additional strengths in bad faith and complex insurance litigation. Chambers and Partners has been publishing the leading guides to the legal profession since 1990. More than 150 full-time researchers identify and rank the world's best lawyers and law firms based on in-depth, objective investigation in over 185 jurisdictions.